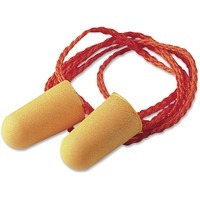 Soft, corded earplugs conform to the unique shape of each ear for excellent hearing protection and comfort. Comfortable, cloth cord helps prevent earplug loss. Tapered design fits comfortably in the ear canal and offers a smooth, dirt resistant surface for hygiene. Earplugs are made of soft, hypoallergenic foam. Noise Reduction Rating NRR is 29 decibels. CSA Class AL. Earplugs are test compatible with 3M E A Rfit Validation System.